Do the tools provide the means for improved collaboration between engineering and manufacturing, and incorporate manufacturing best practices? Can all data and program information reside in one database or platform that is accessible concurrently by all enterprise stakeholders—from design engineering to the shop floor? Is it possible to perform real-time multi-disciplinary simulations to improve performance and manufacturing targets? 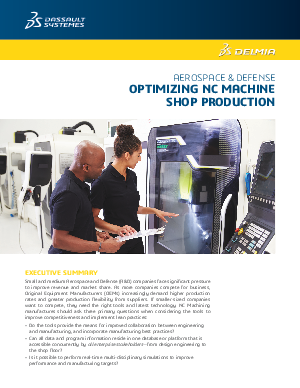 Discover how to optimize your NC Machine Shop Production, minimize shop floor delays, and capture best practices for re-use and standardization. Small and medium Aerospace and Defense (A&D) companies face significant pressure to improve revenue and market share.